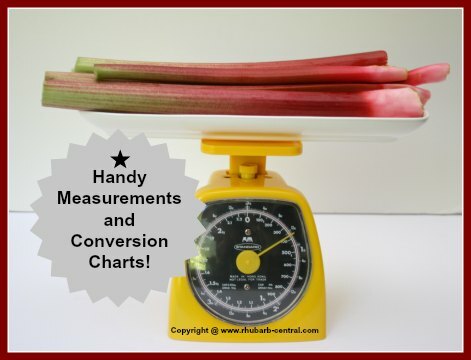 Rhubarb Conversion Charts Metric Standard - How much Rhubarb? How much Rhubarb Makes One Cup? How much Rhubarb In a Pound? Wondering how much rhubarb you need for a recipe? Here, below, are PRINTABLE charts .. not just rhubarb conversion charts for rhubarb equivalent measures, but handy reference charts for ALL kitchens! Charts to use for converting conventional to metric and vice versa, and more! Throughout this website recipe measurements have most often been given in Conventional Measures, so using these charts will enable you to use all the recipes using Metric Measures. Printable Measurement & Conversion Charts for Every Kitchen! Note, that in these conversion charts, the metric equivalent charts for spoons, cups and dry measurements are not an exact conversion, but rather have been rounded-off to the "working equivalent" (Standard Measure). I have always appreciated the kitchen weigh scale that I have used from the first day I moved into my own kitchen. Most weigh scales show both the metric and the conventional measurements. I find it extremely handy, a great time-saver, and it leaves me with less mess, when measuring ingredients using the scale in stead of filling a measuring cup with the ingredient. Here follow some examples of great kitchen weigh scales available for purchase online at *Amazon.com ... they make a great gift idea too!